Metcalfe’s Garage Ltd has been proudly serving Treherne and area since 1900. 5 Generations ago, Thomas A Metcalfe started in downtown Treherne in the farm equipment business. We started selling new Ford Model T’s in 1911, and by 1924, we had sold 100 of them in a single year. For most customers, this was their first motorized vehicle purchase, so part of the delivery process was teaching customers how to drive! We most certainly didn’t need to include today’s technology such as Tire Pressure Monitoring Systems, My Ford Touch and Parking Assist back then. We have records back in the day of customers purchasing a car or truck in the spring, leaving us a partial deposit, maybe even some grain or livestock in trade, and then we would bank roll them until fall when their crop was harvested. We truly were a car dealership and a finance company, all under one roof. Many customers even came in to buy a vehicle, pull out an old sock that had a roll of cash-this sock was their “savings account”. Metcalfe’s has evolved thru the generations with Clare (Shorty) taking over from Thomas, followed by Hilliard, and then his 2 sons, Jack and Bruce Metcalfe. Today Neil Metcalfe is President and Dealer Principal. We are currently in our 3rd building, conveniently located on #2 Highway, just east of Treherne. We are a fully certified, Ford Millennium facility with just over 16,000 square feet of building and over 4 acres of property to serve you. We operate with a great selection of new & pre-owned inventory, a well-stocked parts department, and of course, certified Ford technicians. 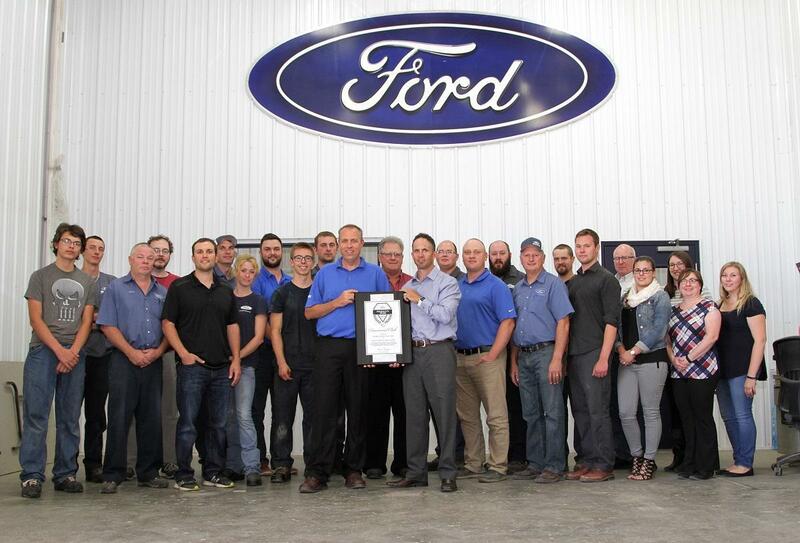 We are proud to be consecutive recipients of Ford’s President’s Award with Diamond Club recognition for superior sales, service and ultimately, Customer Satisfaction. We trust that you will find our website helpful and we most certainly look forward to meeting with you soon. Stop by Metcalfe's Garage for all your Ford service needs. Questions? Any of our knowledgeable service and sales people can help. Call 888-905-5196.